The BBC’s flagship football show has been struggling for relevancy for some time. 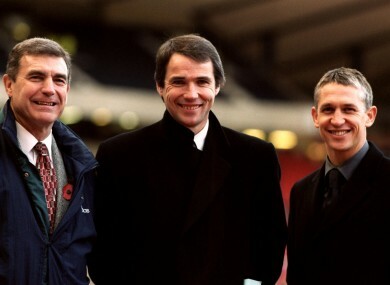 The Match of the Day crew from 1999. If there are still people out there feeling pleased about the news Alan Hansen will leave Match of the Day at the end of the season, perhaps this would be a good moment to provide some ballast by offering a resumé of the chief candidates to replace him as a weekly regular among the lolling, satin-shirted Easter Island heads ranged around the BBC’s coffee table. There are some obvious contenders. Most people would agree Robbie Savage is quite good when he doesn’t try to be opinionated and objectionable but instead just lets his natural objectionable opinionatedness come out of its own accord, like a peppery and asphyxiating televisual pheromone. Martin Keown has an appealing stubbly-faced urgency and talks in an excitingly hoarse whispery tone as though continually telling you a secret you already know. Michael Owen manages to communicate an oddly furtive and pleading monotony, reminiscent of a man being held captive by off-screen kidnappers and forced under duress to offer evenly modulated opinions on long throw-ins and set-piece situations. My own outsider selection would be Glenn Hoddle, who has the right degree of absolute conviction that what he’s saying is almost dangerously important, offering his views insistently, sadly, devastatingly, like a man in a high-viz jacket who appears at the door late at night to tell you your dog’s been run over. Before we go near any of this, it might just be worth addressing the broader subject of ambient Alan anger. This has undoubtedly been one of the more oddly momentous TV farewells, with reactions to Hansen’s passing tending to alternate between callow and snarky triumphalism and a quieter strand of fond, sombre eulogy, as though rather than simply stating he plans to stop talking about football on TV next year Hansen has instead drowned at sea, or announced by video message that he intends to launch himself bodily into the heart of the sun to save the earth from a potentially disastrous gamma ray pulse. At the end of which all that seems clear is that football punditry is an incredibly important thing to a surprisingly large number of people, albeit Hansen remains the only one of the BBC’s in-house talking heads capable of rousing such complex and nuanced emotions. I think I know why, too. It isn’t so much to do with Hansen qua Hansen. It is instead his broader misidentification as a kind of founding Alan of the new football order. As a pundit Hansen is as old as the Premier League itself. Both made their debut in 1992, back in that dreamy, fizzy, gaudily gift-wrapped debut season. Early Hansen was hip, startlingly composed and brusque, a free-to-air prophet of the new football dawn. Even now, having completed a conjoined transition from youthful novelty into a congealment of complacency and repetition he retains the air of a godfather to the regime, the Premier League’s own distant and disappointing sperm donor. So much so it seemed entirely appropriate Hansen’s retirement announcement should come a day after Greg Dyke’s speech this week about the Premier League’s impact on English football generally. Combing the charge sheet, in among the academy suffocations and village greens overrun with West African utility midfielders I half expected to find a bit about how on top of all this Alan Hansen keeps sinking lower and lower in his seat like a deflating latex mannequin barking out self-contained one-word sentences. This is not to make excuses for Match of the Day, which is separately pretty awful: the format, the personnel, the room-temperature gaiety and the horribly twee and self-satisfied studio set, which you half-expect to notice has a Christmas tree in the corner every week, and which when it does actually have a Christmas tree fills me with a raging desire to drive to the studio, burst through security, storm on to the set and seize it roughly out of its tin bucket, rattling its baubles, scattering its faux-presents, with no clear plan beyond whirling it around malevolently like a tinsel-draped lance. And yet Hansen seems to exist on a level beyond all this. It is hard to be on television and he is actually very good at it, but there is something unfortunate in his main flaw, a certain monotony, an absence of fine-grain insight, that chimes unhappily both with wider dissatisfactions and with the excellence of others elsewhere, most notably Gary Neville on Sky, who seems to have endless hours to stride about his magical chocolate factory, pointing and whirling and declaiming brilliantly like a Victorian child genius inventor in a stovepipe hat. Analysis has moved on, leaving Match of the Day a tiny island of simplicity, Hansen as its gilded figurehead, its basic flatness, that sense of simply having a view, without actually ever looking any deeper, chiming energetically with the wider sense around English football of set-in mediocrity, of a blazered, track-suited sofa-bound conspiracy of complacency. Hansen didn’t make any of this happen, but in our confusion it is still strangely easy to blame him, incoherently, for the general dissolution of hope, for Robbie Fowler getting injured, for post-Euro 96 drift, and for the sense that nobody really seems to be able to get a handle on exactly what went wrong and when, as captured so memorably this week in Dyke’s address. Foreign players. Academies. Greed. Diabolical. Unbelievable. Er. Someone do something. Email “The rise and fall of Alan Hansen and Match of the Day”. Feedback on “The rise and fall of Alan Hansen and Match of the Day”.